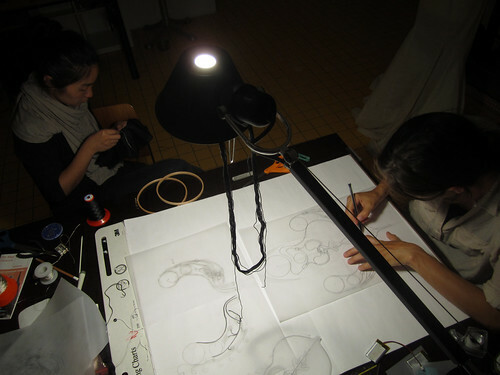 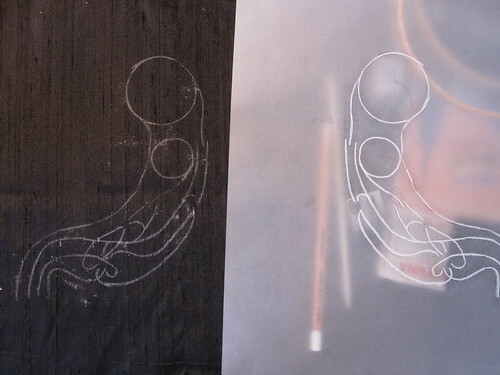 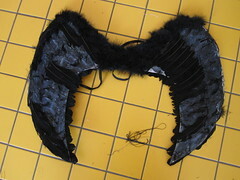 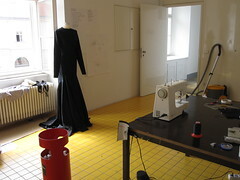 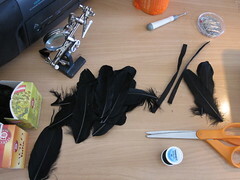 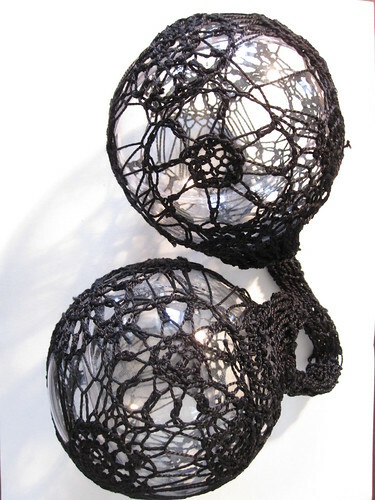 This “making-of” documentation shows the process of developing and making The Crying Dress during a one-month residency at the MuseumsQuartier in Vienna, Austria. 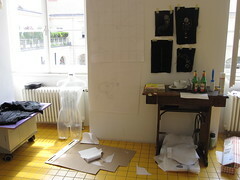 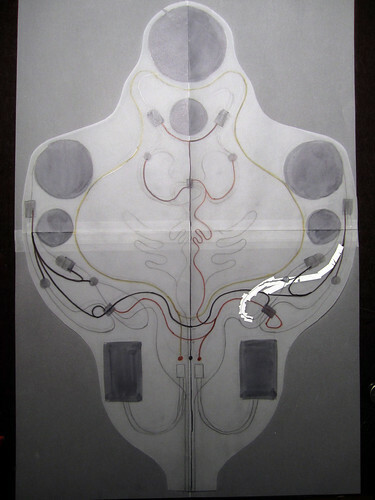 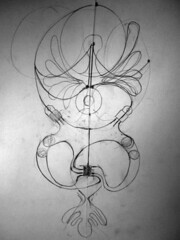 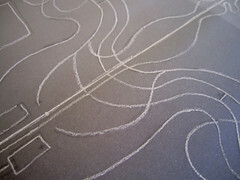 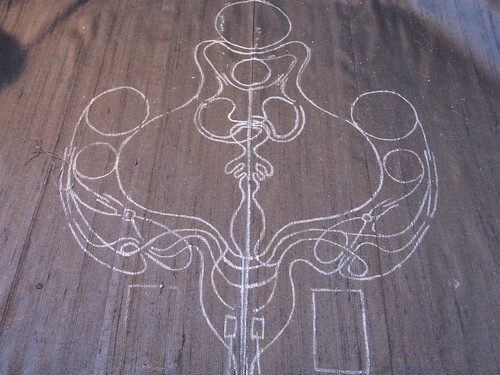 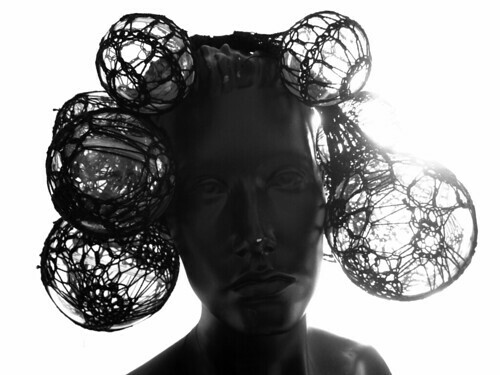 Conception and planning of the work took place in the months prior to the residency. 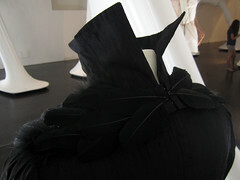 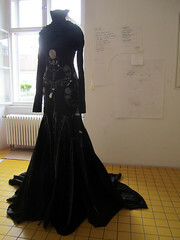 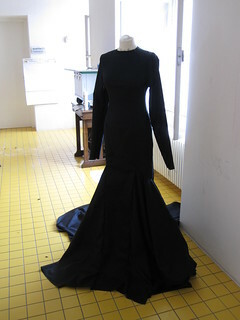 As did the tailoring of the dress pattern for the gown. 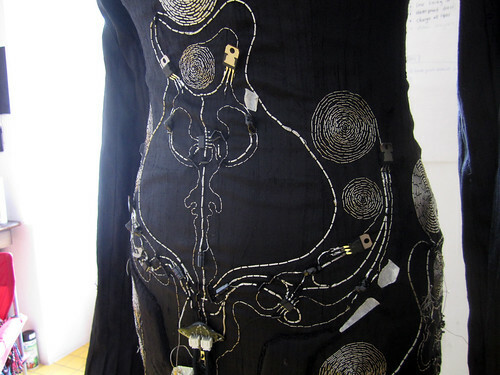 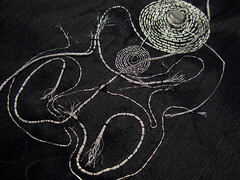 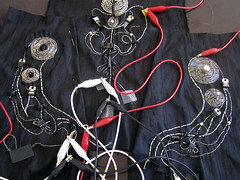 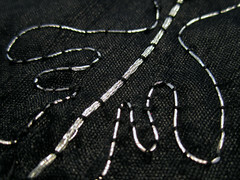 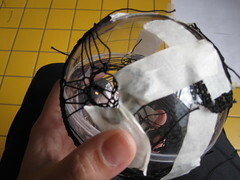 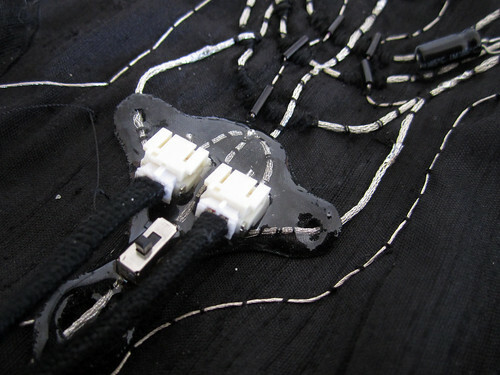 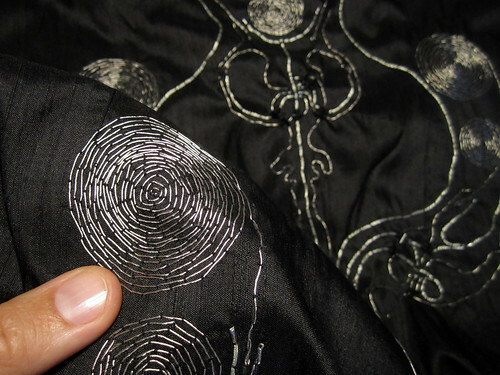 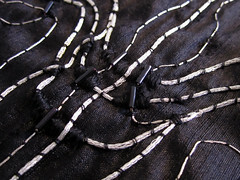 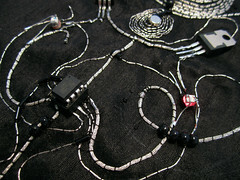 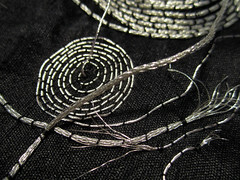 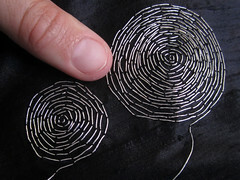 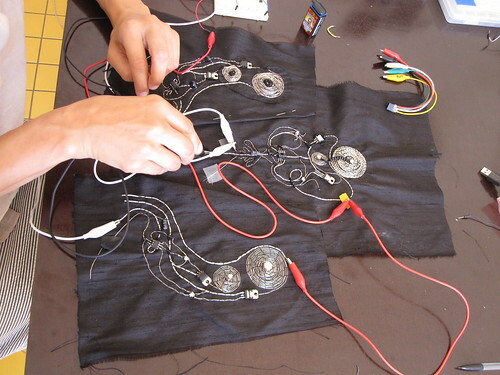 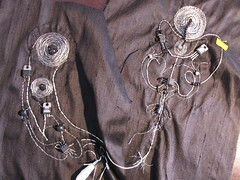 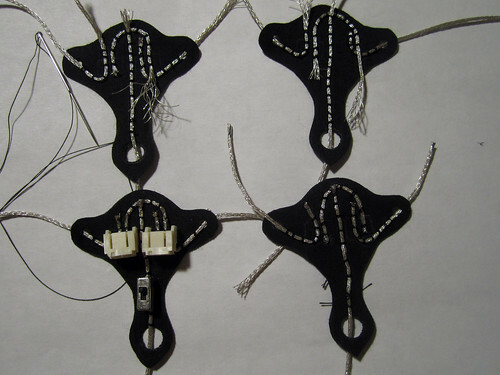 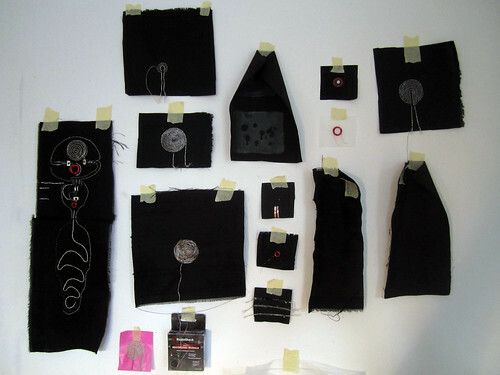 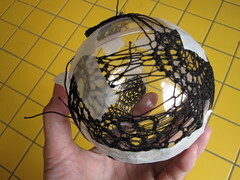 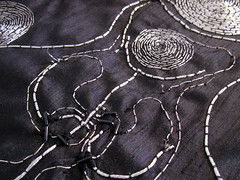 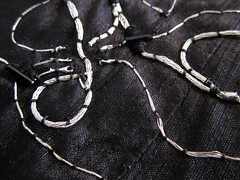 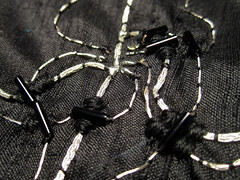 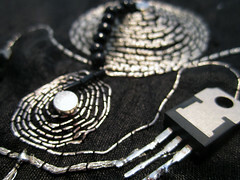 The process of embroidering the circuitry started about half-way through and it took up most of the time. 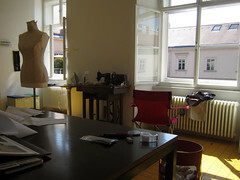 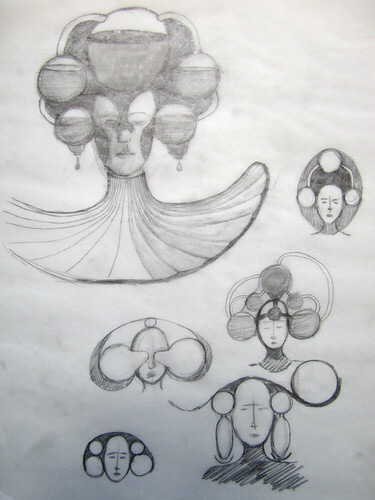 This process was tedious as well as enjoyable, and the weather in Vienna was amazing. 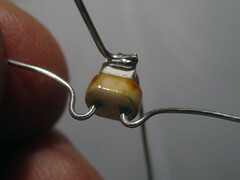 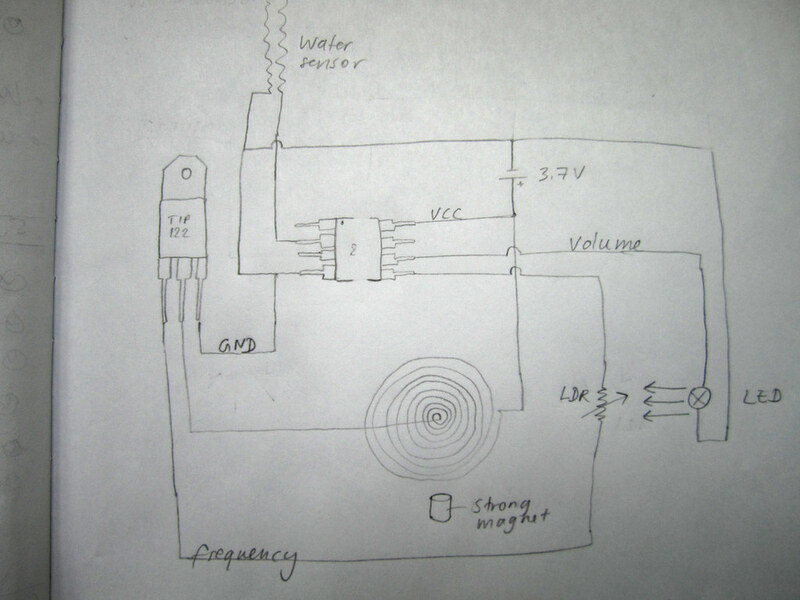 Making nice looking power jumpers to turn on the side and back circuit. 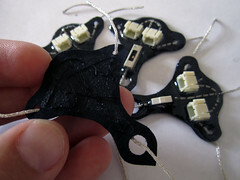 Loading the final program on the microcontrolers already soldered to the circuitry. 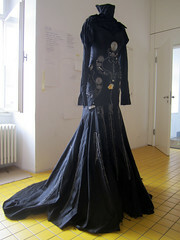 We finished the dress on the very last day of our residency. 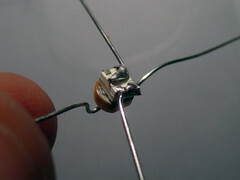 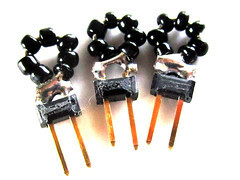 In the ATtiny85 datasheet see page 93, Table 12-5 for how to change the value of the prescaler. 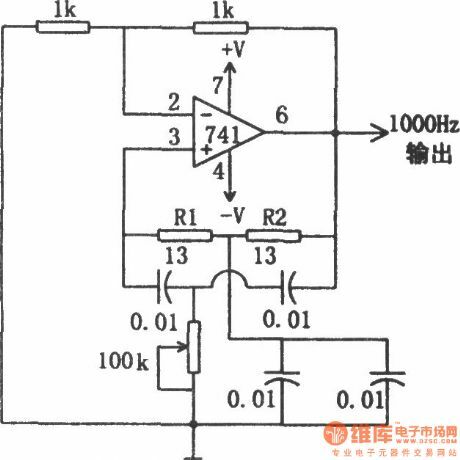 * (CPU frequency) / (prescaler value) = 15625 Hz = 64us. 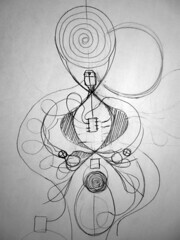 * (desired period) / 64us = 8. 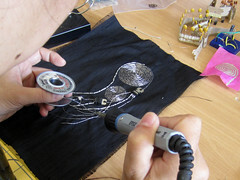 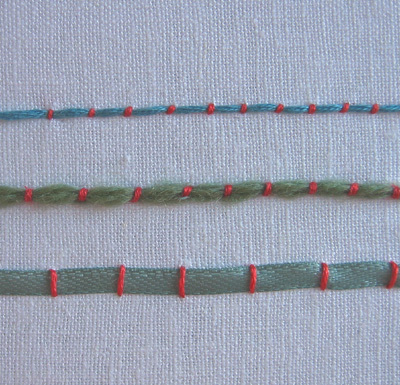 Some of the embroidery techniques we’ve looked at in the course of learning different embroidery stitches and using them to embroidery both the circuitry from conductive threads as well as decorative elements. 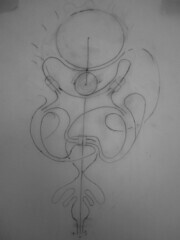 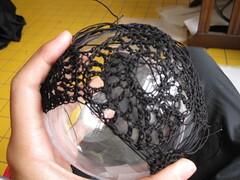 Final test of final pattern before finalizing it. 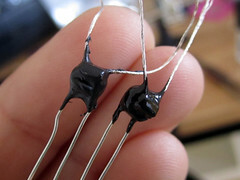 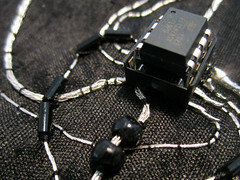 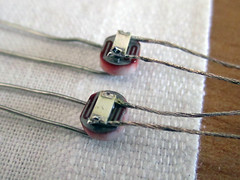 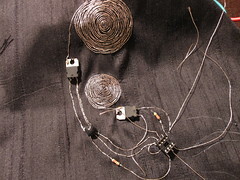 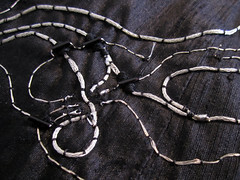 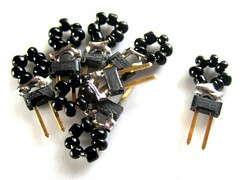 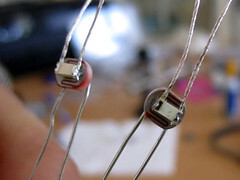 Final pattern is made up of three modules with one ATtiny microcontroller each. 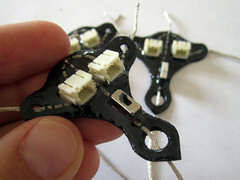 Each microcontrolelr reads one sensor input and outputs two different frequencies to to two seperate speakers, using two PWM LED lights to LDR volume controls. 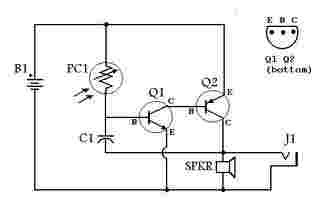 Using the circuit schematics bellow, i assembled the following circuit. 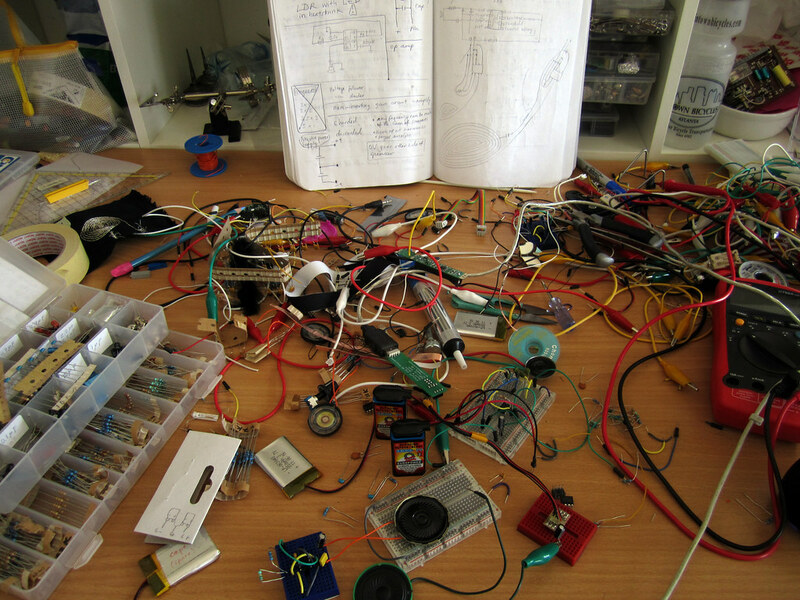 I found the following values to work for me. 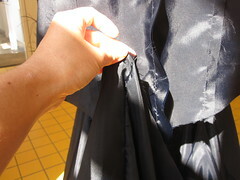 First, we assembled the liner of the dress. 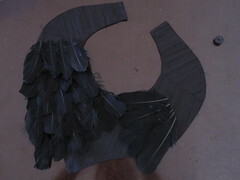 Here are some pictures of the progress. 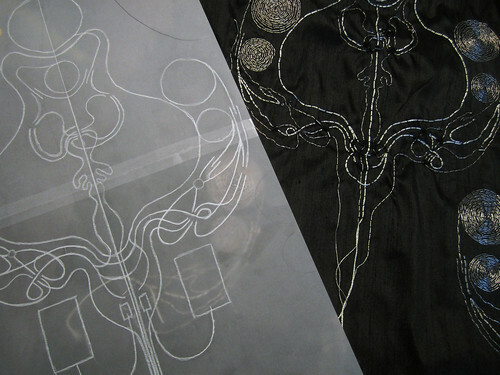 First, we assembled front and back top panels and embroidered the pattern.. you do not want to know how long it took to embroider them. 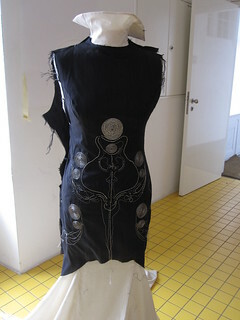 Then we connected the front and back pieces and applied the side embroidery pattern. 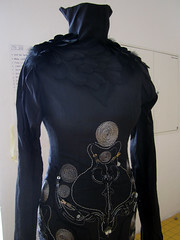 The picture is the outer layer top with pinned sleeve on liner. 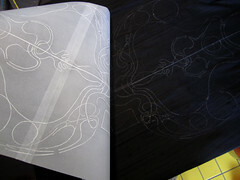 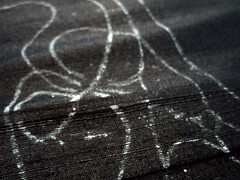 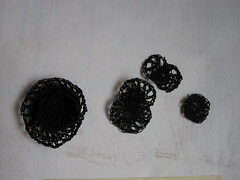 The below picture shows all the outer layer panels after embroidery. 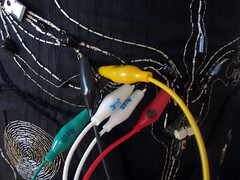 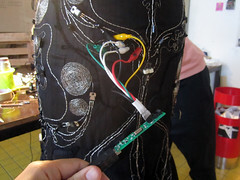 It was assembled at this point, then connected all the sensor connections from the pattern on the skirt to the top, then finally all the components were placed with soldering. 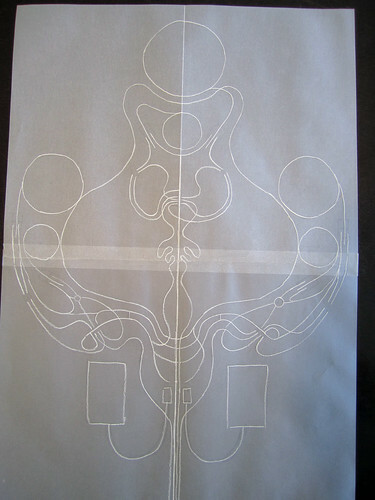 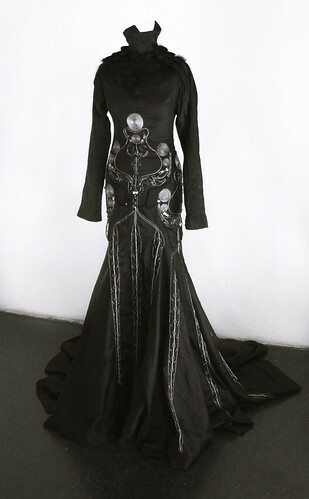 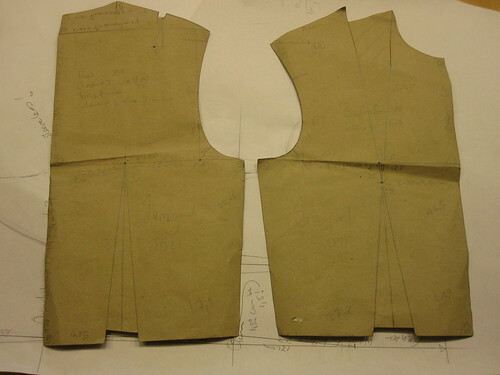 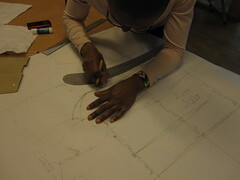 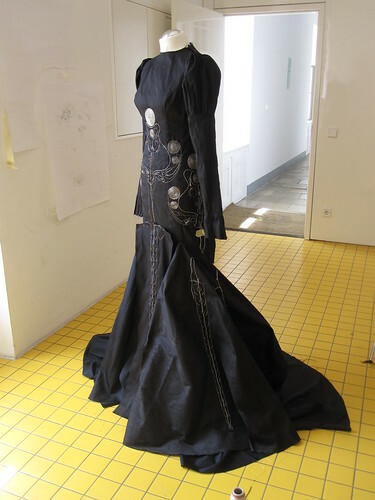 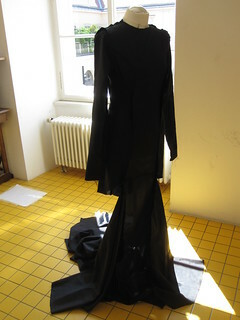 Prior to the residency, dress pattern was prepared at the Swedish School of Textiles with the help of Irmgard Mkhabla and Karin Schneider, Master students at the fashion department. 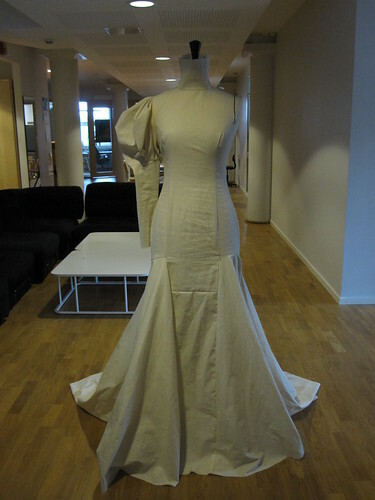 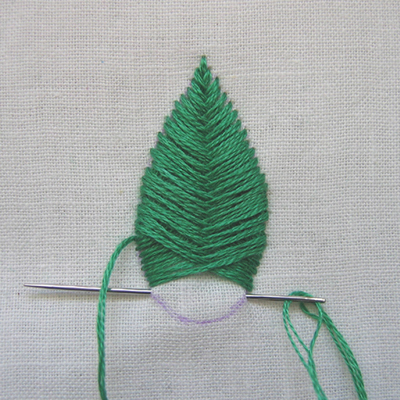 First, Irmgard showed me how to use the basic pattern and construct different cuts/styles. 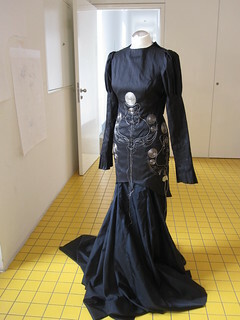 The style I chose for the crying dress is called “princess style” with two dart line going on the side vertically. 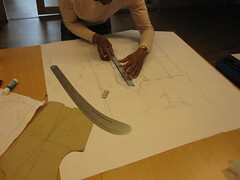 Then Karin helped me to trim the first pattern trial to fit to the body (we are using size 36 doll), alter the pattern to do the second pattern.. until you reach the perfect fit. 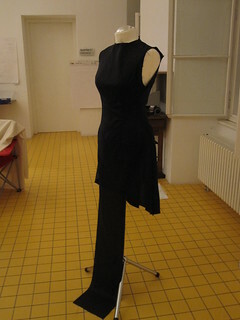 It is quite amazing how many toiles (trial dress with white toile fabric) you make until you fix the final pattern. 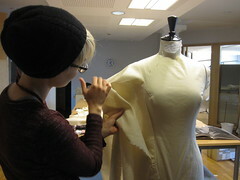 Karin also did a draping for sleeve pattern. 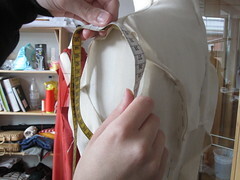 You first drape (pin the fabric on a doll) and mark the pinned position, and reflect it back to the paper pattern so you can repeat it. 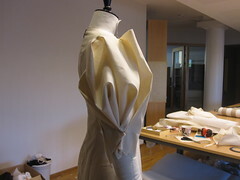 This big whipped cream sleeve needs a really a lot of fabric! 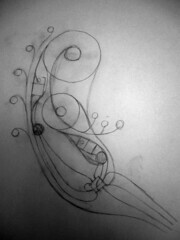 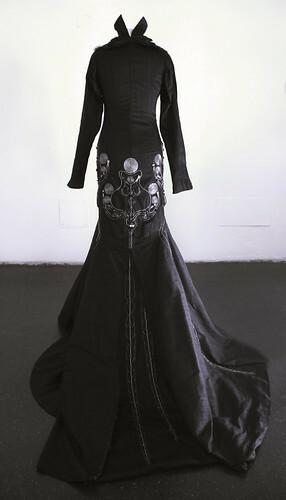 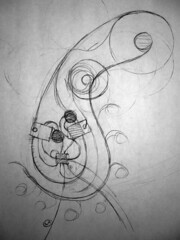 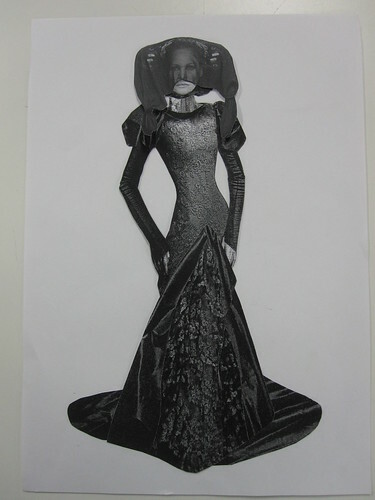 The first sketch/image I made was this cut up photos of dresses put together. 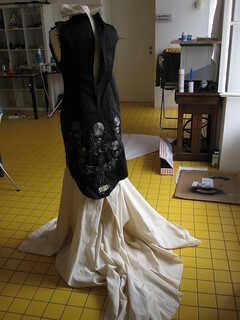 and the below image is the toile dress came out from working with them. 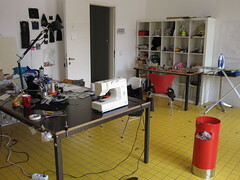 Thanks to Irmgard and Karin! 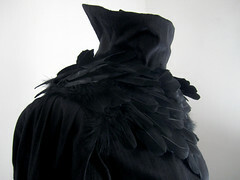 Keening is a form of vocal lament associated with mourning that is traditional in Scotland, Ireland, African, African-American, and other cultures. 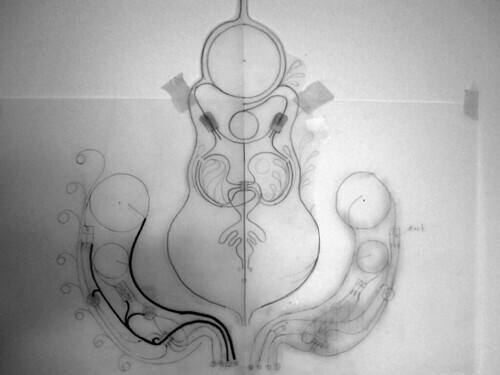 Ululation is a long, wavering, high-pitched vocal sound resembling a howl with a trilling quality. 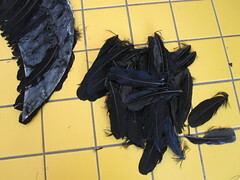 In Sardinia, a man’s worth in life can be determined by the number of women crying at his funeral.